Can a goalkeeper at her/ his goal kick a soccer ball into the opponent's goal without the ball touching the ground? The distance will be about 95 m. A goalkeeper can give the ball a speed of 30 m/s. no, the goal keeper can not score without the ball hitting the ground. This is College Physics Answers with Shaun Dychko. Since the level of the opponent’s goal is the same as the level of the goal for the goalkeeper kicking, we can use the range formula. So we’re going to ask is, the maximum range that the goalkeeper can have by kicking the ball, is that going to be greater than or less than 95. 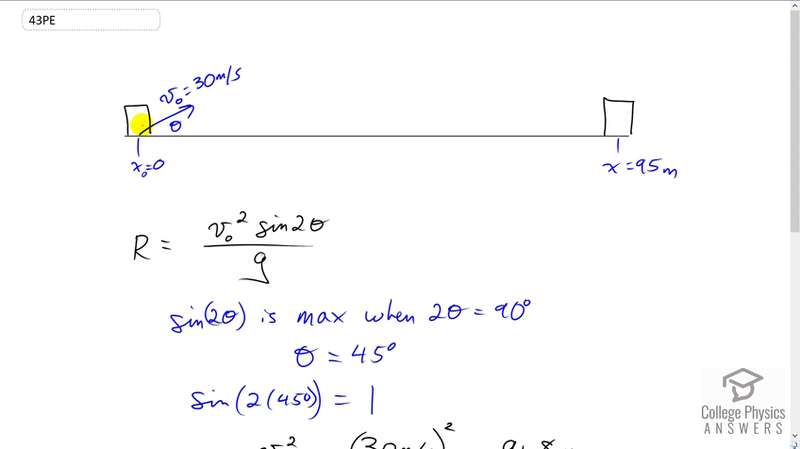 So the maximum range will occur when we have sin two theta being a maximum. That will happen when two theta is 90, because the sine of 90 is one. And that is the maximum number that a sine can have, is one. So we take theta to be 45 in other words, because we’re taking the sine of two times an angle and we want that to be 90, so we divide both sides by two here to solve the theta and it’s 45. So with theta being 45, and therefore we’re taking the sine of two times that, so we’re taking the sine of 90, and that being one. This formula reduces to v squared over g. And we’re told that the goalkeeper can kick it at 30 meters per second, and we’ll square that and divide by acceleration due to gravity of 9.8, and we get a maximum range. I put the max subscript there to say that this is a formula for maximum range, is 91.8 meters. And that’s not far enough because the goal is at 95 meters away, so the goalkeeper cannot score without the ball hitting the ground. They might still be able to score, but the ball’s gonna bounce somewhere here, and then go in.